Lon Chaney's Fagin is overshadowed by Jackie Coogan's Oliver Twist in 1922 silent film. Sometimes it seems Charles Dickens must have written for the movies. Who can resist that pathetic scene: "Please, sir, I want some more"? 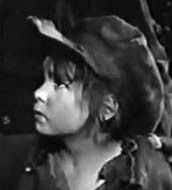 Small wonder that Oliver Twist has been a favourite of screen adaptations since the early silent era. And while every film changes or compresses the plot in some way, it always includes that orphanage dinner tableau. The picture of little Oliver with his bowl held out for more gruel has remained as iconic of humanitarian liberalism throughout the twentieth century as it was of reform in Dickens's time. It's further interesting to note how the other standard elements of the Oliver Twist story have fared. However many changes may be wrung by the myriad adaptations, certain elements are always present, though played up more or less. For instance, the character of Fagin as the misleader of young boys into criminal pursuits is always a dramatic hub of the story, with his Jewishness emphasized to different degrees. He ranges from a common criminal whose race is incidental to a virtual Shylock complete with hooked nose, hanging locks and unrelieved rapaciousness for coin. The first really noteworthy Fagin was a good one, portrayed by the "man of a thousand faces", Lon Chaney. The 1922 Oliver Twist was actually the fifth or sixth silent adaptation of the Dickens novel but the best of that era. Chaney resists the temptation—which must have been difficult given the need for obvious histrionics in silent films—to play a Jewish stereotype. His Fagan is charming, scheming and whining as the character is required to be but never cringingly so. If any criticism can be made, it's that he does not get enough screen time, as nearly the entire complicated novel is crammed into the movie that runs under an hour and a half. Most time is deservedly given to seven-year-old Jackie Coogan, the world's top child star of the day, whose own company produced Oliver Twist between his bigger Hollywood hits. Coogan actually looks a little too young for Oliver, appearing as barely more than a toddler to my eyes and about half the size of the Artful Dodger and the other kids. But he works wonderfully in the role—pathetic and cute without every seeming to be playing to the camera. He suffers internally in a way that comes across visually without tears, without big gestures and certainly without words..
Director Frank Lloyd is of the non-nonsense school of direction. He creates a completely realistic early nineteenth-century London, quite an achievement given his resources then. Then he gets believable performances out of his actors and points the largely stationary camera in the direction where it will get the most impact. Unfortunately he's got an impossible task in trying to encompass all of Oliver's story. He does succeed amazingly well, fitting in just about every subplot and minor secondary character of the novel. The price he pays though is choppiness in the narrative. The intertitles have to be used to introduce obscure figures and clear up loose plot ends. The second half of the story involving the Monks intrigue against Oliver's inheritance and Fagin's downfall suffers the most from compression. But, in truth that's the weakest part of Dickens's novel anyway. It's the first-half story of Oliver as orphan, his capture by ruffians and his eventual redemption that we want and that we get in full. This is a silent movie and I know some people just will not watch it for that reason. And, yes, it is somewhat melodramatically presented as silent movies are. But watch it once and you'll see how seminal it is in the history of Oliver Twist adaptations. Later Olivers copy many of Coogan's moves. Later Fagins are obviously exaggerations in one direction or another of the character Chaney laid down first. And later movies seem to have learned from Lloyd how to handle Dickens's famous but flawed work. But few did it better, apart from having spoken dialogue and more advanced materials and technical expertise.